I stock lots of pretty colors of craft eyes in my shop. But, what do you do if you want something I don’t have? Like pink eyes? Or glitter eyes? Or polka dot eyes? Hmm… those would be hard to find. You can paint them yourself! Today, I’ll show you how to paint your own craft eyes! All you need is clear craft eyes and some paint. And since there are oh, about a thousand, colors of paint available… the possibilities are endless! Have you seen Beanie Boos? They’re the new generation of Beanie Babies… and they have glitter eyes! 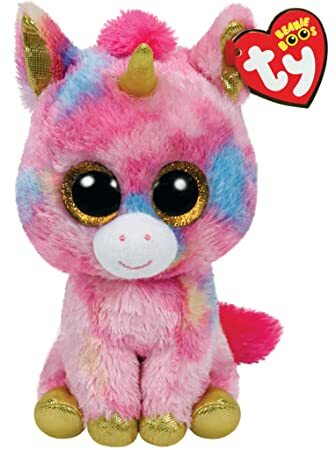 This is Fantasia the Unicorn, image from AmazonI’ve been getting lots of requests for glitter eyes, because you want to add this awesome touch to your own stuffed animal creations. I can’t find anywhere where they are commercially available… but, I have found the perfect glitter paint! Aren’t these amazing? And they’re even more sparkly in person! Glamour Dust paint is fantastic! Painting your own craft eyes is easy! All you need is some acrylic paint and clear craft eyes. I filmed this tutorial before I got the fancy palettes, and I realize my thumb is often in the way… oops! But, I think you get the idea! Isn’t that easy? And here’s the result! Ready to paint your own? Get a glitter eyes kit or just some glitter paint and give it a try! The kit contains 3 colors of clear eyes: 12mm, 15mm and 18mm. I’m working on making these available individually, but for now, the only way to get all three sizes is to get the kit! Sorry – the kits are no longer available, but you can get the paint here. What a cute and simple way to make a project stand out. Who doesn’t love glitter? Yes, there are a number of shops that sell hand-painted glitter eyes. This post is for folks who’d like to do it themselves… clear eyes are about 25% of the cost of finished ones. A big savings if you do a lot!